Managing Director of the Techstars Mobility Accelerator. Ted Serbinski is an entrepreneur and early stage investor operating at the intersection of Detroit's automotive dominance and its entrepreneurial resurgence. Detroit has recently earned a new nickname: Comeback City. Just four years ago, Detroit came out of bankruptcy. We remember that day vividly because it was the same day we announced the first Techstars mentorship-driven accelerator program in Detroit: Techstars Mobility. We saw potential in Detroit, that it could take deep industry knowledge and become a hotbed of innovation for both corporations and startups. Over the past four years, we’ve partnered with local corporations to gain their expertise and help them grow their innovation muscles. We’ve activated the Detroit startup ecosystem through the Techstars mentor network, facilitating over 10,000 meetings between startups and successful entrepreneurs, investors, corporations, and government organizations. We’ve brought 44 startups to Detroit from eight different countries, spanning industries including automotive, transportation, city infrastructure, travel, manufacturing, and materials, who have raised over $80 million and are valued at over $215 million. The Demo Days for these accelerator classes have become huge events for the community, attracting over a thousand attendees each year. Techstars Startup Week Detroit attracts thousands more to its annual celebration of entrepreneurship. And, just last October, Detroit joined in the 2nd annual national Techstars Startup Weekend Latinx in Tech. Our next step: Techstars is investing even more in Detroit, and transforming Techstars Mobility to Techstars Detroit. We started with mobility—the industry that everyone knew Detroit could do and that Detroit itself knew it could do. That was four years ago: today, Detroit does that and so much more. “The word Mobility was becoming too limiting,” says Ted Serbinski, Managing Director of Techstars Detroit (and MD of Techstars Mobility for all four years). “We knew we needed to reach a broader audience of entrepreneurs who may not label themselves as mobility but are great candidates for the program.” Techstars Detroit is still looking for startups who identify as mobility innovations, but is also looking for startups that associate with industries such as manufacturing, IoT, and more. They’ll benefit enormously from working with Techstars corporate partners for the 2019 program: Ford, Honda, AAA, USAA, Nationwide, PlanetM, and, new for 2019, Lear. These partners know just how crucial it is to partner with startups and keep innovation top of mind. Detroit has seen what happens when you don’t. Techstars Detroit is the natural evolution of all the work we’ve done previously, from Techstars Startup Weekends, to Techstars Startup Weeks, to a mobility accelerator, and now a broader accelerator—this is the arc of a successfully maturing startup ecosystem. Startup ecosystems have natural biorhythms; they evolve. What Detroit needed four years ago is different from what it needs today. Every community has a vertical or an industry that they excel in, but to move beyond that is a sign of maturation. Detroit can now support a wider version of entrepreneurship. After four great years, we’re so glad to provide yet another nudge to the startup ecosystem of the Comeback City. Four years in, our engines are revving and we’re just getting started. Applications for Techstars Detroit are open! Apply today. Three years ago, Techstars Mobility opened its office in downtown Detroit at Ford Field. We began our mission investing and mentoring entrepreneurs from around the world building the future of mobility. 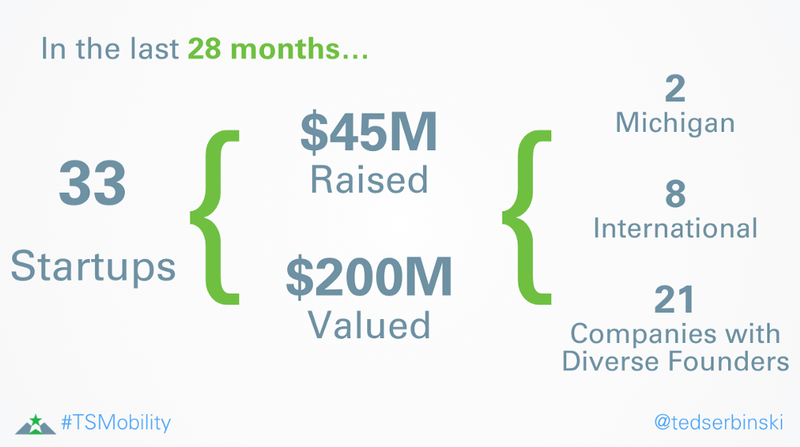 Since then, we’ve invested in 33 startups from 6 different countries, who have raised $45 million valued at over $200 million. This summer, we’ll announce 11 additional startups that we’ve invested in that will be part of our fourth class. We’ve built a burgeoning mobility community, with 359 active mentors spanning 143 organizations. We’ve facilitated 7,500 meetings between founders, investors, corporations, and government organizations. We’ve hosted over 3000 attendees across our Mobility Demo Day, held annually in the fall. Two of our investments have been acquired as well–Bosch acquiring SPLT and Hagerty acquiring Classics&Exoctics. Today, I’m excited to announce we’re moving to the 7th floor of WeWork Merchant’s Row, centrally located in downtown Detroit. We will continue to run our program out of this space, foster the growing mobility community, and plug into the increasing density of companies along the Woodward corridor. In partnership with WeWork and PlanetM, we’re designing a community and space where the future of mobility will converge. We’ve also teamed up with Oblong Industries to offer their visual collaboration technology, Mezzanine, in two of our new meeting rooms. In addition to the new office, we’re also welcoming back several returning corporate partners and a few new ones for our fourth program. 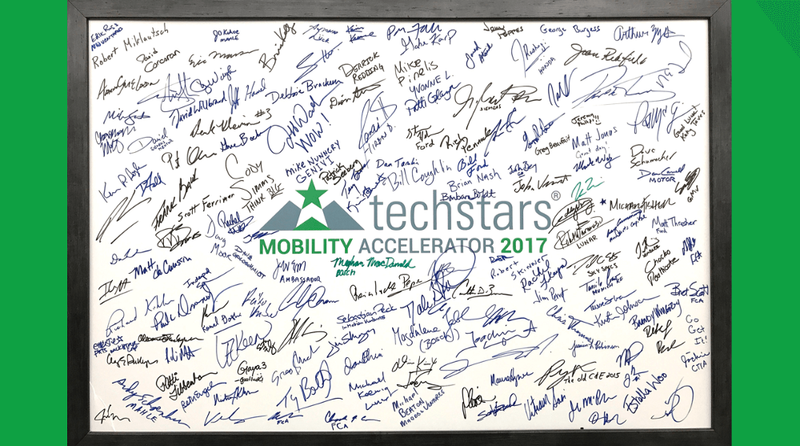 Techstars Mobility’s corporate partners work closely mentoring and supporting the founders going through our Mobility program. And if you’re looking for ways to get involved in Detroit, visit the startup community website #StartupDetroit and join the Slack room for the latest events, job listings and conversations happening in the city right now. Here’s a quick look at why our outstanding mobility partners chose to work with Techstars Mobility to drive global innovation in the future of mobility. AutoMobili-D is the perfect entry point for early-stage mobility startups to build up their networks with key influencers and decision-makers in the automotive mobility industry. The mobility startup expo at AutoMobili-D runs January 14-18, 2018 in downtown Detroit. For the second year in a row, Techstars Mobility has partnered with the North American International Auto Show (NAIAS) to bring over 50 global startups to Detroit in January 2018 to showcase their innovative mobility technologies as part of AutoMobili-D, a dedicated mobility technology expo. This partnership is part of Techstars Mobility’s ongoing mission to connect the automotive mobility and startup worlds by breaking down silos and building partnerships. Startup applications for the 2018 AutoMobili-D showcase are now open. If you’re a startup, apply here by Oct 31st to secure your spot and a discount of $499 (price goes up to $999 November 1st). Be part of NAIAS 2018 (aka the “Detroit Auto Show”), among the most prestigious automotive shows in the world and one of the largest media events in North America. The inaugural year for AutoMobili-D attracted 40,000 automotive and tech industry executives, designers, developers and analysts from 2,274 companies and 27 countries. AutoMobili-D has expanded to 150,000 sq. ft. in 2018 to accommodate increased demand. This year startups can be found in the center of AutoMobili-D.
New in 2018, startups featured in the expo at AutoMobili-D will be eligible for matchmaking business-to-business meetings with automakers, suppliers, venture capitalists, and other organizations. Also new in 2018 is the formation of the Mobility Advisory Board for AutoMobili-D. 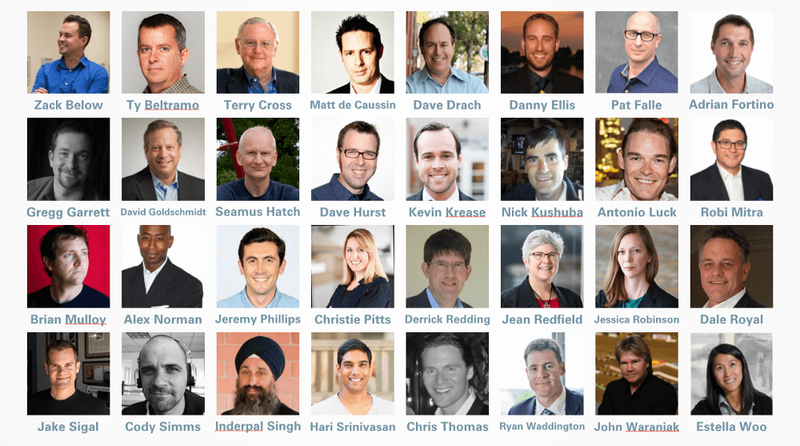 This advisory board will be helping to curate startups at AutoMobili-D, speaking on panels and giving talks, and lending support to continue to build the innovation bridge between Detroit and Silicon Valley. 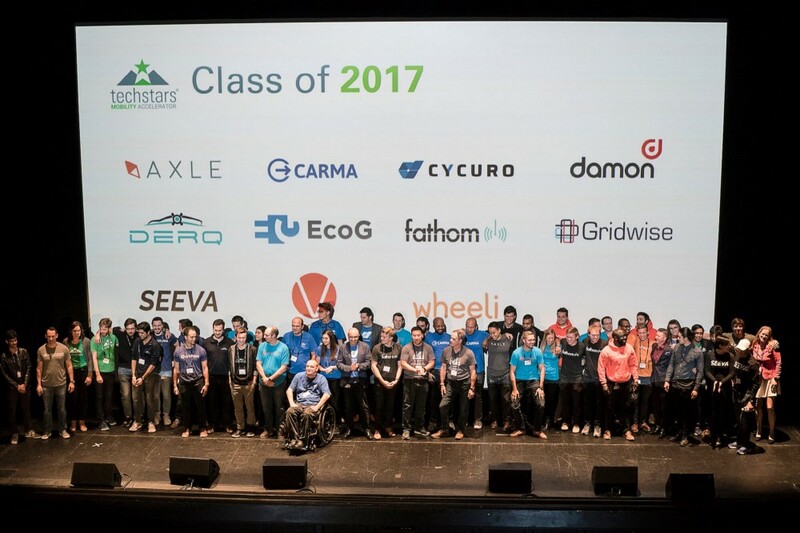 Last year, during the inaugural AutoMobili-D, 50 startups participated from all around the globe, including the U.S., Canada, Dubai, London, and Portugal. The technologies included artificial intelligence and machine learning, to autonomous and connected platforms, to infrastructure communications and security applications. One of those startups was Acerta, which offers an artificial intelligence platform for machine analytics, which provides OEMs and Tier-1 manufacturers with automatic and real-time malfunction detection and failure prediction. At AutoMobili-D, founder Greta Cutulenco met ZF Group, one of the largest global Tier-1 manufactures. ZF Group soon became a key customer, which helped Acerta raise a $2M investment seed round. Now in its 30th year as an international event, the NAIAS is among the most prestigious automotive shows in the world, providing unparalleled access to the automotive products, technologies, people and ideas that matter most – up close and in one place. The event is hosted in downtown Detroit, the heart of the automotive industry. 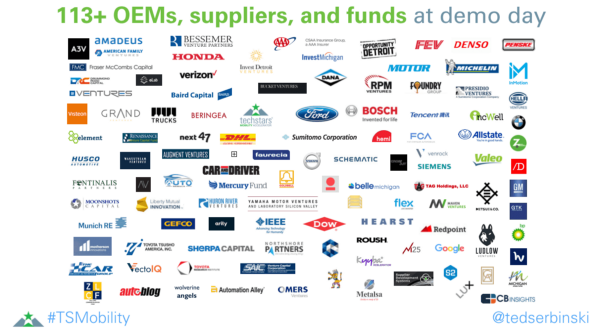 The inaugural launch of AutoMobili-D in 2017 featured more than 180 brands, ranging from automakers to suppliers, to tech startups as well as universities and government organizations. From John Krafcik debuting the fully autonomous Chrysler Pacifica, to Carlos Ghosn providing insights into Nissan’s plans for a connected future, to Julia Steyn on Maven’s outlook on urban mobility as a service, these great industry leaders and many others took the stage and delivered more than 40 hours of mobility-focused discussions and announcements. 110 speakers representing 100 different companies spoke on a variety of talks and panels. For a list of this content, check out this post which details the talks, panels, and discussions. This is a pivotal time for the automotive industry, as technology and mobility services are becoming integrated with manufactured steel. We’re witnessing the convergence of Detroit and Silicon Valley. Through the AutoMobili-D showcase, this will be the second-year an auto show has a dedicated startup expo showcasing the future of automotive mobility from downtown Detroit.